Welcome to the first Roll20 Review! This is a new series in which I review the paid modules available for sale in Roll20. First up – Curse of Strahd. Roll20 has been my group’s go-to resource and website for online role-playing for the last two years. We’ve been enjoying Dungeons & Dragons Fifth Edition for most of that time, finding it a wonderful system of intuitive mechanics and flexible role-playing. Roll20’s built-in Fifth Edition character sheets help make rolling and stat-tracking a breeze. Roll20 is free to use (with optional paid subscription for added goodies) with the caveat that it can be a lot of work to put together virtual maps and tactical battlefields. When I ran both Lost Mine of Phandelver and Princes of the Apocalypse, I purchased the battle maps from the artists, then converted them into Roll20. I created tokens and placed them throughout each map, and built every monster and character sheet from scratch. Roll20 is amazing at giving you the canvas and tools, but you still have to put in the work. About a year ago Roll20 began releasing the official D&D 5E campaigns as paid modules, beginning with The Lost Mine of Phandelver, followed shortly by Storm King’s Thunder. Since then Roll20 has released paid content for the Monster Manual, and additional published modules in Tales of the Yawning Portal, and, most recently, Curse of Strahd. Curse of Strahd released last year as an updated remake to the classic gothic horror RPG world of Ravenloft, ruled by the vampire lord Strahd von Zarovich. The new campaign recreates the Valley of Barovia as a sandbox adventure, culminating in a Castlevania-like dungeon crawl inside Castle Ravenloft. This is not a review of Curse of Strahd the D&D campaign, but Curse of Strahd the Roll20 Marketplace Module. A collection of supplemental material from the DMG and MM that’s appropriate to CoS, such as information on Hag Covens, Exhaustion, Madness, and traps. That’s a sizable amount of features, many of which are shared between Roll20’s other official D&D releases. 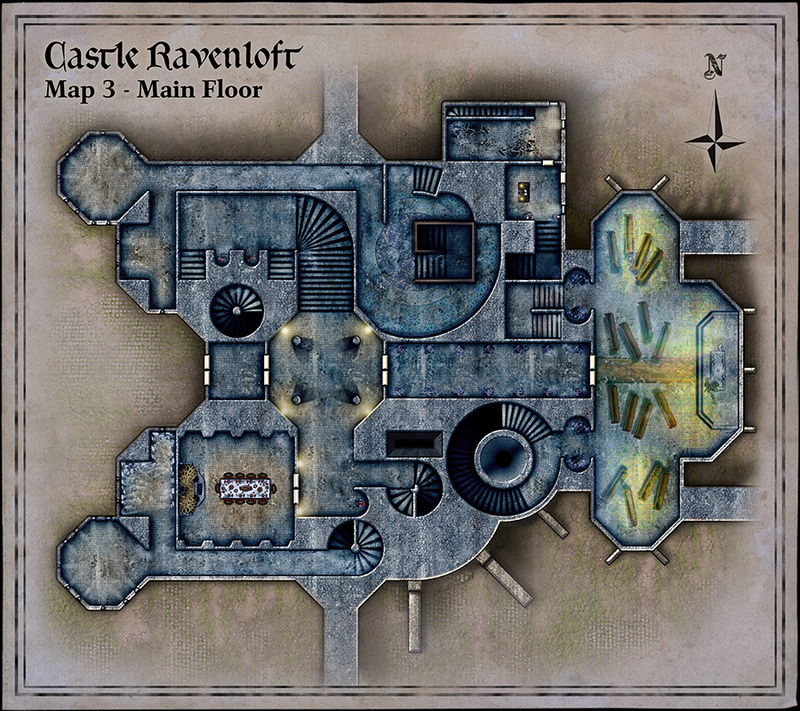 Of particular note are the brand new tactical grid maps for Castle Ravenloft and the unique Tarokka deck and Deck of Illusions functionality. In the published campaign book, Strahd’s infamous castle is visually represented by a series of isometric cut-outs. These are beautiful and fun representations, but mostly worthless when you need a top-down grid to battle on. Roll20 came through with the biggest missing ingredient to being able to easily run Curse of Strahd in a virtual tabletop format. The entire Castle, from the towering spires to the crypt-filled catacombs have been painstakingly recreated using the appropriate gothic horror art style. As with all the other maps it includes a fully annotated GM layer with labeled areas, secret passages, traps, and notes for connecting levels. It’s too bad the Castle maps aren’t available for separate purchase as they make for a fantastic multi-level large-scale dungeon crawl for any adventure. 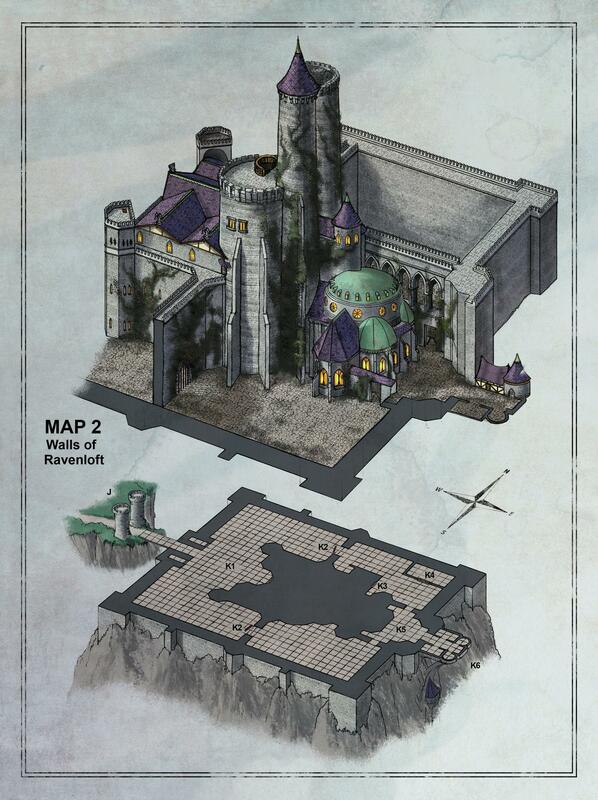 The only new map that didn’t quite work for me was the outer castle grounds labeled “Ravenloft 2.” There’s no Dynamic Lighting on the castle itself and the map has a garish dashed-line blueprint to represent the castle’s footprint underneath. But players aren’t arriving to the castle in a helicopter armed with the blueprints! Thankfully the Roll20 module does include all the original isometric maps, and I’d suggest using the isometric version for the outer tower grounds as a visual handout, and only parts of the new tactical grid map for the outer castle region. The other isometric maps are nice to have as the DM but incredibly spoilerific if you let your players see them. Otherwise all the other maps are pulled from the campaign book, with most offering 5 or 10 foot battle grids. For the maps that use 10-foot grids, Roll 20 has already adjusted the scale to make all the tokens half size. For the life of me I don’t know why Wizards of the Coast insists on using 10-foot grid squares on some maps when the 5e rules fall apart on anything other than a 5-foot grid map. There’s a very helpful GM handout at the top that details each battle map and its scale. No adjustments should be needed for the 5 and 10-foot maps, which are your primary dungeon and encounter battle maps (10-ft maps use subdivided grids and smaller tokens). Larger maps, such as towns, are a bit more abstracted, though still contain tokens. There are instructions for scaling things down if you demand perfect size accuracy for trying to fit battles on the town map. As it is you may have to zoom in uncomfortably close on some of the maps like Valaki to see what’s going on. Token names don’t seem to scale down, and they can become unwieldy with just a few on screen together (though names are only visible to you the DM unless you edit the token). A single Random Battle Map page is included, but it’s just a blank, gray grid page bereft of any tokens visual effects. I would’ve loved to see at least one generic gloomy forest map or something. Any Roll20 DM can whip up a proper random encounter map, and you’ll need to do so here. There’s also no decent landing page for the DM that contains all the tokens. The best you have are potential encounter tokens in the corners of maps where they can appear, such as the floors of Ravenloft. The fortune deck is a really neat feature of the Curse of Strahd campaign that I have mixed feelings about. On the one hand it’s delightfully flavorful to dictate the player’s journey via a mad gypsy woman and an ominous fortune telling. On the other hand we’re talking about major pieces of the puzzle being left up to complete chance, which would irk many a DM. 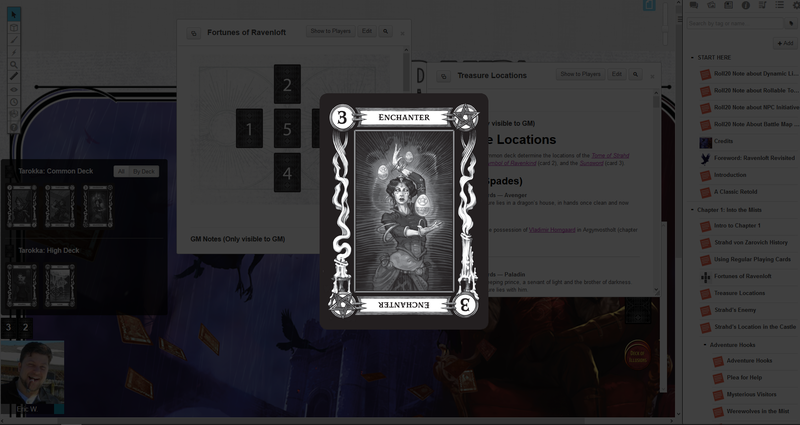 The Tarokka deck included with the Roll20 module makes me err toward the side of letting the cards fall where they may. It’s an incredibly nifty feature that lets you shuffle and deal out the Common and High decks to the players, letting them flip over the cards with way better immersive artwork than simply translating a standard deck of playing cards. It’s a fun feature that’s well integrated into Roll20. Likewise your players may obtain the Deck of Illusions, and once you see it in action you’ll hope they do. It operates much the same way as the Tarokka decks: flip on the macro, then deal a card. The deck rolls the illusion in the form of a card which transforms into a token that you can then place onto the map. Brilliant! Multi-sided tokens allow you to quickly transform the many lycanthropes and other shapeshifters that inhabit Barovia. Simply right click and select multi-side to get a sliding bar. All the placed tokens use the average HP rules from their character sheets. This is fine (and expected) though as a DM one of the first changes I would make would be to go through and roll hit points for each NPC to add a bit more randomization. The new outer castle grounds map could’ve used some more dynamic lighting coverage, and/or multiple map pages. The Verdict: Curse of Strahd is a fantastic implementation of the 5E campaign with the excellent converted top-down grids of the Castle Ravenloft maps being worth the price alone. Thanks for the review! I’m getting ready to run it for my group and roll20 has really done a lot of the work for me. I’m excited to take my group into Barovia for the first time.